Memories by AmyInKy: I made cards! 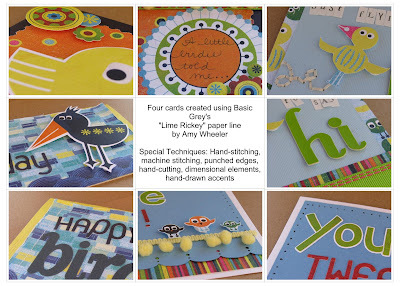 I've never really enjoyed making cards. I have to admit, I sort of feel like they are a waste of good supplies. I mean really...who keeps cards? OK...I do...but I know I'm probably the exception. Cards usually get tossed. I hate thinking of my Thickers or pricey embellishments getting THROWN AWAY! 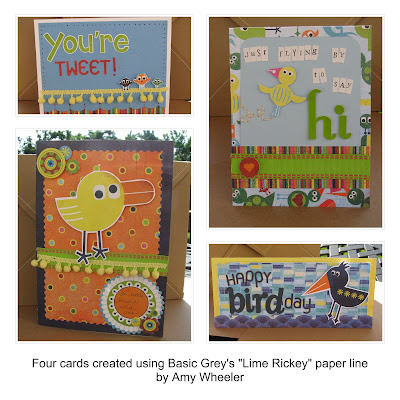 But, I had a challenge to create four cards using a coordinated line. (You know I'm not one to pass up a challenge, right?) I decided to use the Basic Grey Lime Rickey line. I got creative. (I tried not to think of them lying in the trash can!) I sort of enjoyed it. And, I was actually really pleased with my results. I love the cards. I don't do many cards but I am thinking of doing homemade ones as thank you's for the gifts and staff after we go home. Thanks for the inspiration. Also how do you get your images to display in a neat box like that? Okay I love the cards!!! They look so cute!! That paper line is adorable. I LOVE these cards, Amy. Super cute!